Assuming Warcraft doesn’t count Final Fantasy XV popped my Japanese Roll Playing Game cherry. My first time was flawed, as they usually are, but it was still an utterly enchanting and beautiful journey. The game begins in a very tongue-in-cheek way that’s cute enough that I don’t want to spoil it. Before long, you’re off on the road with your friends and royal appointees in what looks like a futuristic Maybach. The car and the open road play as much of a character in the game as your traveling companions and the colorful characters you’ll meet. Final Fantasy XV is at its best when you’re on the road, exploring a vast area that is gorgeous and full of detailed surprises. Even 40 hours in, there were still enough surprises to astound and delight me. It’s truly a rarity to come across a game that feels as though it is made with such love. Your companions are as much the main characters as the up-and-coming Prince Noctis. By your side, Gladiolus (the muscle), Ignis (the strategic advisor), and Prompto (a friend of lower social standing who’s good with a camera and a gun). While you can’t take direct control over your companions, you can give them orders and they act intelligently enough in battle to always feel as though they are helping and never a hindrance. Battle, while rather simple, can be a lot of fun. Noctis has this cool teleportation ability that allows him to traverse ground and either stab at an enemy directly, or allow him to evade to a vantage point for a better strategy. If turned on, the game will go into a “wait mode” where you can scan creatures and adversaries for weakness, turning the game into a pseudo-turn based style. If not turned on, everything is in live action. The haphazard plot is where things start to go awry. For the most part, the game makes almost no sense. Given enough time, you can sort of piece together story points, but even if you’ve seen the animated film that came before the game’s launch, much is up in the air as a result of odd editing. Without wanting to give away any details, there’s a key action that happens early in the game, and it sets a pretty heavy mood that subsides once you’re back on the road and everything is fun and games once more. There’s also the matter of how the main quest of the game progresses. While I found it refreshing when elements became more linear, FFXV does so in a way that feels drastic and slightly nonsensical. Then there’s the matter of the much-maligned Chapter 13, the most linear and one of the longest chapters in the game. It’s nearly insufferable, and I believe this is the case with patching after its release. What’s wrong with it? It’s not a game-breaker, but it’s not fun to play. Some have gone so far as to call it one of the worst developed levels in modern video game history from an AAA game. It’s just incredibly tedious, stretching a good hour in which the gameplay changes, refreshing for a second because of its variety, but almost instantly a chore for the players who have had so much to love within the game. That’s a main quest. Not surprisingly, some of the side quests are rather flat. It would be nothing short of incredible if the game had over 80+ unique missions and experiences, but there’s no denying that there can be a lack of variety. Yet, by game’s end, I’d be surprised if you aren’t even slightly moved and hungry for more. Luckily, the game caps out at character level 100, meaning you can improve and hone your skills against increasingly more difficult, and hopefully more interesting missions. As a reward for completing your journey, areas that you’ve visited will unlock to provide additional rooms and bosses. In addition, there’s the Season Pass that’s available for $24.99. It’s unclear what exactly it will add to the game, but I imagine it will be quality. 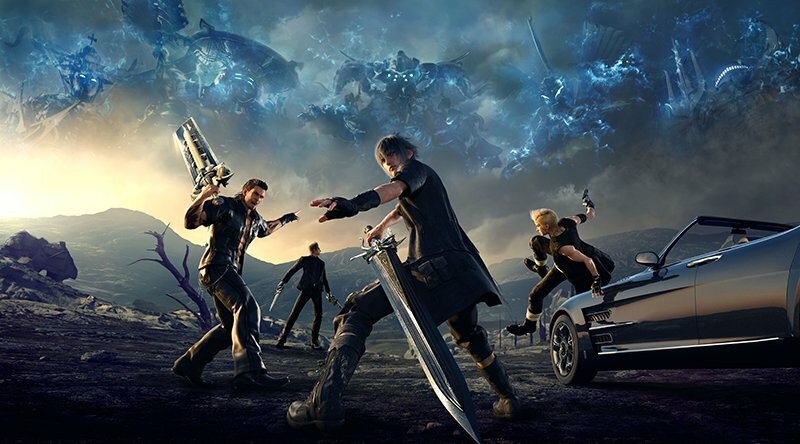 Should you get FFXV? As the game boots up and notes, it’s a game for fans and first-time players alike. As a first time player, I can verify the accuracy of this statement. It’s no small time commitment, but it’s an adventure unlike any other recent game I can recall, and it’s one of my favorites of 2016. I’d go so far as to say it’s a flawed masterpiece.